Dr. Watson receives an urgent telegram telling him that Sherlock Holmes in lying in a hotel room in eastern France and near death. 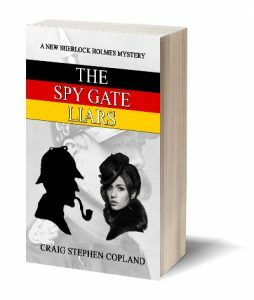 He immediately rushes to aid his dear friend, only to find that what began as a doctor’s house call has turned into yet another adventure as Sherlock Holmes races to keep an unknown ruthless murderer from dispatching yet another former German army officer. The events that led to this Channel-hopping spy and murder mystery began in the Franco-Prussian War of 1870. But the evil that was done back then has continued until the present day and vengeance will be had. The story is a tribute to the original story in the Canon, The Reigate Squires. In America it was published as The Reigate Puzzle, as Brits in those days assumed that an American would not know what a squire was.